Fenway Health To Make Onsite Multi-Person Restrooms All Gender | Fenway Health: Health Care Is A Right, Not A Privilege. Fenway Health To Make Onsite Multi-Person Restrooms All Gender | Fenway Health: Health Care Is A Right, Not A Privilege. Fenway Health To Make Onsite Multi-Person Restrooms All Gender – Fenway Health: Health Care Is A Right, Not A Privilege. 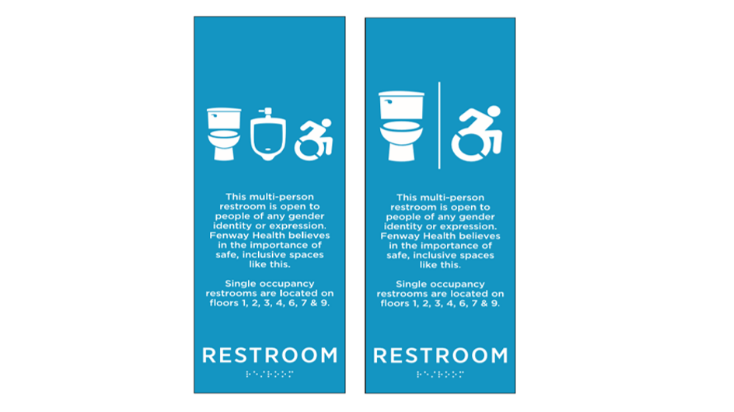 As part of Fenway Health’s commitment to creating inclusive and welcoming spaces for everyone who walks through our doors, we have installed new restroom signage on the multi-person restrooms at 1340 Boylston Street. Multi-person restrooms will no longer use gender specific labels such as WOMEN or MEN, but instead will be labeled RESTROOM with pictures identifying the type of facilities inside, either toilets only or both toilets and urinals. Community members have expressed that labeling restrooms with specific gender terms can make people who have different gender identities, or no gender identity, feel uncomfortable or unwelcome. Signage will direct people to the location of single person, all gender restrooms if they feel more comfortable with that option. This project is beginning at 1340 Boylston Street first, and we may make this update to all multi-person restrooms at all Fenway Health locations in the coming months.